Happy Friday the 13th! As we all know, if, on this day, you walk under a ladder while carrying a black cat and breaking a mirror, a madman in a ski mask will chase you with a machete. At least, that’s according to the traditional Friday the 13th superstition. I’m joking! The truth is, no one knows exactly why Friday the 13th is considered bad luck. Superstitions, bad luck omens and signs have part of human culture for at least as long as recorded history. Perhaps it’s unsurprising, then, that even martial arts have some superstitions. Here are a few from four martial arts. For the styles that use them, the belt is the most important, revered piece of the uniform. It symbolizes everything you’ve learned and how far you’ve come on your journey. So taking the best-possible care of it would be a priority, right? Well, maybe not. A common Brazilian jiu-jitsu superstition holds that you shouldn’t wash your belt. The given reasons for this vary. “You’ll wash away any luck,” “You’ll wash away the skills you’ve learned,” and “It’s against tradition,” are all ones I’ve heard. If you forget to wash your belt once, it’s not the end of the world. But over the course of training, BJJ belts pick up all sorts of gunk off the mat – blood, sweat, dirt, whatever was on people’s feet when they stepped onto the mat, bacteria…and this all adds up over time, if you never wash your belt. In my opinion, it’s worse luck to risk getting a staph infection from an unwashed belt. (Google “staph infection” and click images if you’re still on the fence). Like all martial arts, tang soo do is about continual improvement – there’s no such thing as an end to your journey. Of course, I don’t think that someone who’s put the time and effort into reaching the final belt would just quit, regardless of its color. But I like the sentiment! There are many lucky (and unlucky) numbers in China. Often, this luck is determined by what other Chinese words the number sounds similar to. For example, four is unlucky because the Chinese word for four, sì; sounds like the Chinese word for death, sǐ. 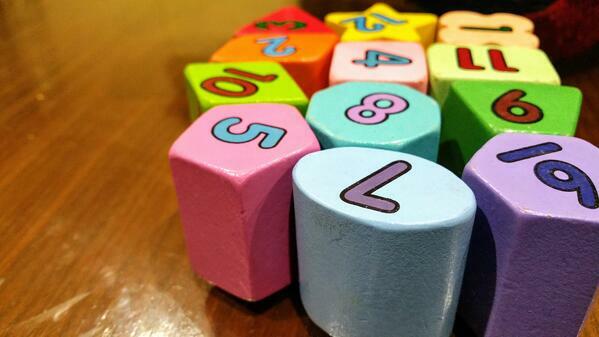 Numbers are considered lucky if they’re associated with a positive homophone. Two, three, five, six, eight and nine are all lucky. These numbers often crop up in the Chinese art kung fu. There are five main animal styles of kung fu, many two- or three-part moves, dual weapons, six harmonies (three internal and three external), and more. There are so many lucky numbers, it seems like you’re bound to pick up on luck somewhere in your kung fu training! That said, if you scrupulously applied the luck/bad luck number system to every day of your training, it would get tedious. We touched on the ritualistic aspects of muay thai, such as the Wai Kru dance, in an earlier blog. The Wai Kru is a dance that is performed by fighters before a match. It was once the belief that the dance sealed evil spirits outside of the ring; however, today the Wai Kru is performed as a sign of respect from the fighters to their coaches. However, it’s another piece of the muay thai ceremony that holds more superstitious sway. The prajioud, or armband, worn by Thai fighters is a traditional good-luck token. Once, the prajioud were made from pieces of a mother’s clothing and given to her son before he left for war. They carry her blessing and prayer for safety. Today, wearing a prajioud symbolizes the fighter asking for victory for himself and protection for both him and his opponent. Some modern muay thai schools use colored prajioud as a ranking system in place of belts, as seen in the video below. I want to dismiss it, but the one muay thai fight I’ve done, I lost, and I wasn’t wearing a prajioud. I’m also pretty sure I got a concussion. Maybe a prajioud would have helped? We’ll never know now. What about you? What superstitions or good-luck charms do you use in your school or dojo? Share them in the comments below, and have a happy Friday the 13th! 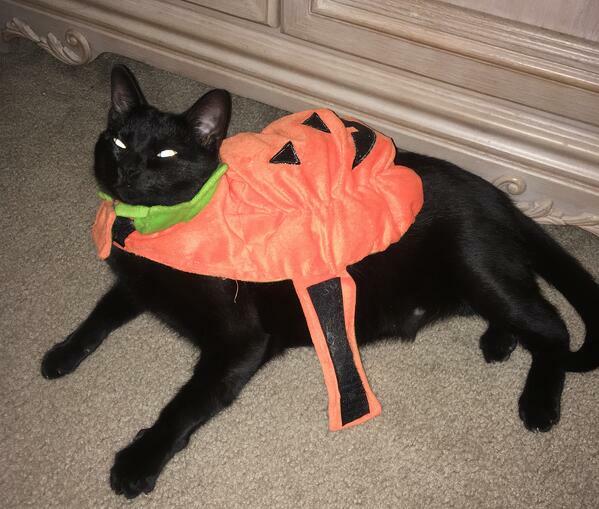 Gratuitous bonus pic of the author's black cat, Max, at Halloween. I don't think he's bad luck, to be fair, but he is kind of a jerk.